Ben Rivers, Ghost Strata, 2018, film still. Image courtesy of the artist, Kate MacGarry, London and Matt’s Gallery, London. For his second exhibition at Matt's Gallery Ben Rivers presents a new film, which is the first instalment of an ongoing project that will be developed and completed over the remaining months of 2018. Echoing his seasonal work Things (2014) the film is divided into chapters determined by the months of the year in which the footage was captured. The work follows the artist's itinerant life, and has been filmed in various locations including São Paulo, Krabi in Thailand and Nottingham in the UK. Ghost Strata explores the differing scales of impact that humanity's presence on the earth has in the present and into the future. Rivers blends his own footage with found sound and text elements to create an evocative meditation on time, memory and extinction. The artist's thinking about the film traces back to his 2009 piece I Know Where I'm Going for which he met with Geologist Professor Jan Zalasiewicz, of the University of Leicester. In the earlier work the scientist discusses with Rivers what traces might or might not be left of human existence in the geological records in 100 million years time. 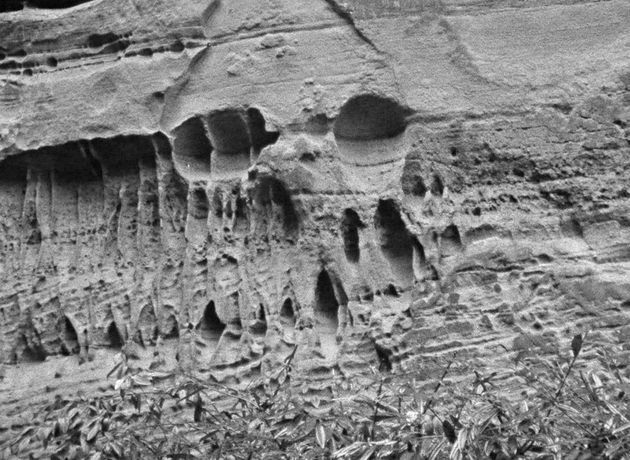 Zalasiewicz introduced Rivers to his concept of 'Ghost Strata' - the missing elements from within the rock faces that despite their absence offer hints of what was once there. In March 2018 Rivers met with Professor Zalasiewicz again, in a former railway tunnel in central Nottingham, to revisit this notion. The tunnel, carved out of the city's sandstone cliffs, allows the viewer glimpses into a mixture of geological and anthropological traces left over millennia of sedimentation and revealed by human intervention. Ghost Strata is the seventh in an ongoing series of 10-day shows at Matt's Gallery. Ben Rivers is represented by Kate MacGarry, London.